Carcassonne, the board game is based on the city Carcassonne located in the South of France. In the Medieval times it was known for the walls that protected the city. Now, your goal is to get into Carcassonne and send out your troops as thieves, knights, monks, and farmers. Be sure to train them well, they will be the basis for your success. Do you think your troops are ready to be sent out? Find out by playing the exciting game of Big Box Carcassonne and find out who will be victorious. 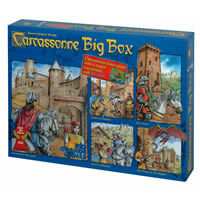 Be sure to check out Big Box Carcassonne today! After the final scoring, the winner of the game will be awarded to who ever has the most points. That isn't exactly as easy as it seems though so be sure to check out the details in the game rules. Inside the box sits 1 scoring track, 72 landscape tiles, 48 followers and the Big Box Carcassonne game rules and instructions. Please keep in mind that the official Big Box Carcassonne party rules and instructions could be different depending on the game version you have. The rules below are some of the exact directions on how to play Big Box Carcassonne. Share with us your comments, funny stories, tips, advice, strategies, creative ways to play, questions about how to play, problems with the rules or anything you want about Big Box Carcassonne. All submissions will be reviewed within 24 hours. Click here to add your Big Box Carcassonne comments.